We’d love your help. 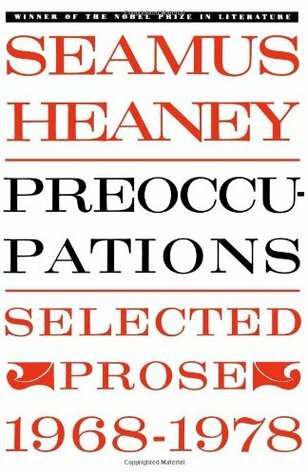 Let us know what’s wrong with this preview of Preoccupations by Seamus Heaney. To ask other readers questions about Preoccupations, please sign up. This book of Heaney's prose was a marvellous second-hand bookshop find. Heaney's prose is every bit as good as his poetry. There was great variety in the pieces, ranging from the autobiographical/personal essays of the first section, through his more detailed lectures on particular poets or aspects of poetry, through to a final section of reviews written for various publications. Of the personal pieces, his Mossbawn about his childhood had all the appeal of Dylan Thomas' writings about his childh This book of Heaney's prose was a marvellous second-hand bookshop find. Heaney's prose is every bit as good as his poetry. Of the personal pieces, his Mossbawn about his childhood had all the appeal of Dylan Thomas' writings about his childhood, but with a much greater clarity and precision to them. This was a delight to read and to read again. His lectures on poets gave great insights into both the poets he wrote of and into his own writings. For instance he made brilliantly clear the difference between the poetic methods of Wordsworth & Yeats. Wordsworth as a master of 'composition as listening, a wise passiveness', whereas Yeats method is characterized 'not by compliance but control'. This sums up beautifully the contrast, and highlights a tension between these approaches to be found in Heaney's own work. "...both ... look and listen with intensity inside their parishes, their eyes and ears pick up different things ... Kavanagh's place-names are there to stake out a personal landscape, they declare one man's experience ... Montague's are rather sounding lines, rods to plumb the depth of a shared and diminished culture." With the chosen samples of their work, he make you want to rush to read both their work + getting back to Heaney's own poetry even more quickly. Hugh MacDiarmid: "In attempting the poetry of ideas ... can write like a lunatic lexicographer." Stevie Smith: "Looked at the world with a mental squint, there is a disconcerting wobble in the mirror she holds." Yet in each case he balances these little thrusts with an appreciation of their strengths. I loved his piece "The labourer & the Lord". His summing up of Lord Dunsany was as succinct and acerbic, as it was entertaining: "His capacity for self-aggrandizement was immense, his inclination to self-scrutiny nil. There was charm (Kipling was fond of him), kindness (he managed Ledwidge's publications and helped him with money) and boorishness: an overbearing sense of himself as the cynosure of neighbouring eyes. Even when there were no eyes to see, he behaved dramatically." It makes me want to go away and read more about the man - he promises great entertainment value. Much more importantly, his appreciations of, and enthusiasms, for other poets - John hewitt, Osip Mandlestam, Robert Lowell and others, was infectious and made me keen to become better acquainted with their work too. Not gonna lie. I had to write 30 pages on Heaney last year and read this in the process. I really fell in love with his poetry after reading his prose. This book is incredible insightful if you are interested in Heaney's poetry, but well worth reading on its own.